Ford is keeping the competition on its toes by not letting down its continuous march toward better and better cars. The C-MAX Plug-In Hybrid wins the title of highest range. 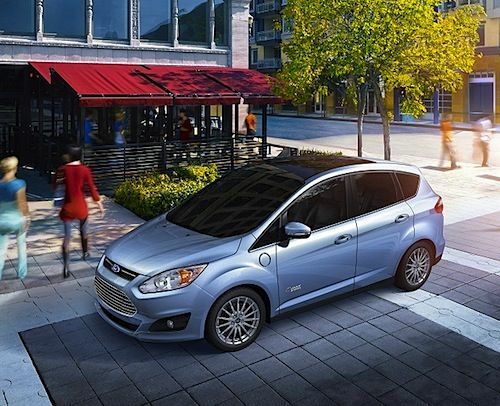 The Ford C-MAX Energi is topping all utility and compact vehicles with its new EPA 620 mile range estimate. The Ford C-MAX Energi takes in the highest range of any utility or compact vehicle on a single tank and a single charge. With up to 21 miles in all-electric mode range, it achieves an impressive 108-MPGe EPA city rating. The electric range triples its closest competitor, the Prius Plug-in. But more than that, the C-MAX Energi addresses a growing trend as more and more Americans commute longer distances and face increased congestion. With the help of electric-only operation in stop-and-go traffic, this could potentially save 1.9 billion gallons of gasoline annually. America’s Most Fuel Efficient Utility Vehicle. A bold title for a company that clawed its way out of the worst recession the country has seen. Ford’s new C-MAX hybrid has already received many accolades and continues to wow many. The soon to be delivered Energi plug-in hybrid has so much range, it could drive from Detroit to New York City, San Francisco to Las Vegas, or even Portland, Ore., to Twin Falls, Idaho, through the combined use of the power stored in the vehicle’s advanced lithium-ion battery and one tank of gasoline. Technically Speaking. With 195 HP on a fully charged battery, the new C-MAX Energi gives you roughly 20 miles on electricity alone. It also includes technologies such as hands-free liftgate and active park assist. With its 108 MPGe city rating and 92 MPGe on the highway, C-MAX Energi gives customers a leading fuel efficiency not found anywhere yet. With the C-MAX Energi up to 21 miles in all-electric mode, this takes away one leg of the average daily work commute for most in the U.S. estimated at 40 miles. At the current rate of gasoline price, this means substantial savings. It also means those daily drives to pick up the kids, coffee runs and groceries could be done using only the electric battery conveniently charged at home. The latest study by the United States Department of the Treasury estimates congestion consumed an extra 1.9 billion gallons of fuel in 2011, approximately 5% of all gasoline used. If everyone drove plug-in hybrid with similar performance, that would keep a lot of money in our local economy. Ford’s Power of choice. The C-MAX Energi is part of Ford’s rollout of electrified vehicles, which include the Focus Electric, whose production began late 2011. It also became America’s most fuel-efficient compact with 110 MPGe city and 105 MPGe combined. The C-MAX Hybrid already delivers an EPA-certified 47 mpg city, 47 mpg highway ratings for a 47 mpg combined rating. Add to this the new Fusion Hybrid, which also became America’s most fuel-efficient sedan with its combined 47 mpg rating and the Fusion Energi plug-in hybrid completes the loop. It will begin production by the end of this year, also aiming to be the most fuel-efficient midsize car in the world with more its 100 MPGe. When? That’s the question on everyone’s mind and according to Ford, the C-MAX Energi PHEV will appear this fall at $29,995 after a federal tax credit. You can add to this other state and local rebates. Ford has had an incredible recovery from the dreaded 2008 year to where it stands now with an impressive portfolio of alternative energy cars that drastically reduce fuel consumption. As the result of a highly effective duo with the Ford-Mullaly era, Ford not only reclaimed its family business style by rekindling customer loyalty but has achieved very impressive performance in economy and driving performance. We look forward to spending quality time behind the wheel of a Ford C-MAX Energi PHEV.